Caitie and Curt wanted help in evoking pirate lore more subtly, so we worked with them on a design that would emphasize the things they treasure. 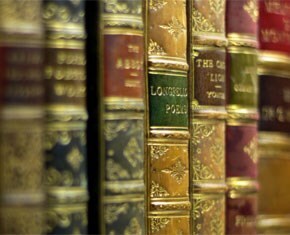 With two degrees in English literature between them, books had to top that list. Inspired by the centerpiece at left, and loving the combination of silver goblets, vivid fresh flowers and beautifully bound volumes, we set out to translate that concept for this special couple. First things first: No books by the yard. Each title had to mean something to at least one of them. Eventually we settled on a stack of three per table, each one representing a different category: pirates and/or princesses, classic literature, and childhood favorites. From The Gold Bug to The Princess Bride, Geoffrey Chaucer to Jane Austen, Harry Potter to The Phantom Tollbooth, we put together a list big enough to supply our projected 15 tables. 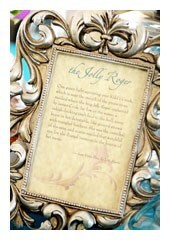 We even worked in a nod to Disney with Peter Pan, Arabian Nights and more. Of course, the books needed to be visually interesting as well, with gilt-embossed leather our first choice and well-loved antique editions a close second. We plundered Curt and Caitie’s shelves first and then their families’ before finally turning to eBay and aLibris. For sparkle, we looked again to family and eBay for silver bud vases and compotes, cut-glass creamers and cruets — anything that would hold a few stems of fresh flowers or a fistful of gems. When we started worrying about being too subtle, we added a handful of more overt touches to help guests connect the dots. We chose parchment invitations and closed each one with a wax seal. Instead of numbering tables, we named them for pirate ships both real and fictional, and ordered hundreds of chocolate doubloons to scatter like confetti. We designated a big glass jar wrapped in raffia for messages in a bottle, in lieu of a guest book. 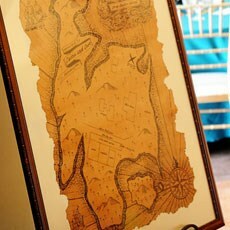 We commissioned a custom treasure map to give guests the lay of the land at the sprawling venue, chose a rum-based signature cocktail, and supplemented the standard photo booth props with cutlasses, bandannas and eye patches. Our pièce de résistance? 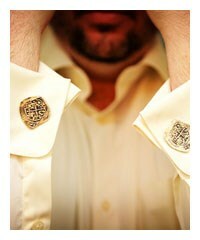 Tracking down cufflinks made from sterling silver "pieces of eight" for Curt and his groomsmen.